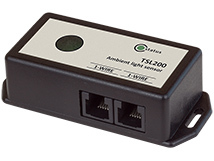 TSL200 ambient light sensor is the newest member of our the 1-Wire sensors family. Тhis product adds extra options to Teracom controllers for environmental monitoring systems and Building’s management systems (BMS). TSL200 1-Wire ambient light sensor is factory calibrated and provides excellent long-term stability. It is supported by Ethernet data logger TCW220, Ethernet I/O TCW241, and GSM-GPRS remote IO module TCG140. The ambient light sensor has a wide dynamic range – from 0 to 83000 lux. This makes it suitable for applications such as office environmental monitoring, light source qualification, lighting control, home automation, building management systems etc. It is possible to combine other types of sensors on the 1-Wire interface thereby to build a variety of monitoring and control systems. Installing multisensor systems with daisy-chain topology is easy due to the presence of two RJ11 connectors. This ensures reliable data transmission from the sensors to the controller. TSL200 has an extended 3-year warranty and will be available at our partners in late August. More information about the product can be found on its product page.